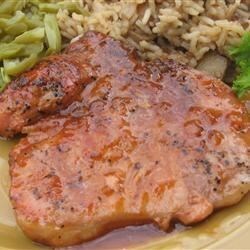 "Spicy tomato sauce easily livens up plain old pork chops." In a bowl, mix the tomato puree, hot sauce, jalapeno pepper, red pepper, and sage. Heat the oil in a skillet over medium heat, and brown pork chops on both sides. Remove chops from heat and set aside. Place the onion and green bell pepper in the skillet, and saute 2 to 3 minutes. Return pork to skillet, and cover with the tomato puree mixture. Cover skillet, and continue cooking 30 minutes, or to desired doneness. 3 ingredients to pork chop perfection! Used a little less flakes and hot sauce, and this was still plenty hot for us. I thought it needed some salt (but I love salt). Served with ruffled pasta and steamed broccoli. We really didn't care for this..not very flavorful. This quickly became a favorite. I make it all the time. I am a sucker for 1 pan meals and this one sure pleases!